Our services are uniquely complemented by our security detail who have had years of experience. In case you wonder what this entails, we will offer security services such as escorts who will discreetly accompany you; leaving you to feel free from constantly clutching your bag or watching your wallet in fear of petty pickpockets. Our security partners will also rise to the occasion should the need for emergency medical evacuations arise or in the event of mechanical failure. This ensures that you have peace of mind through out your entire stay so that all you need do is sit back and relax! We have partnered with lodges that have made it their business to ensure that visitors get the best in Kenyan hospitality. In addition they have a heart for both the natural environment and the neighbouring local communities. Our itineraries have been made to include these lodges to enable you to indulge in luxury to ease your soul and mind. Please read more on the lodges available for your accommodation. For the business traveler, you may just have a day or two to spare but have no idea where to go or what to do? 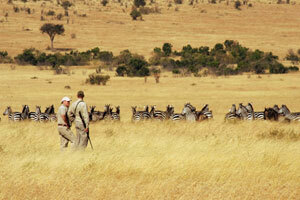 Available are itineraries which take into account short term stays. We will plan a short term itinerary for your stay within the capital or its environs to ensure you maximize on the limited time available. 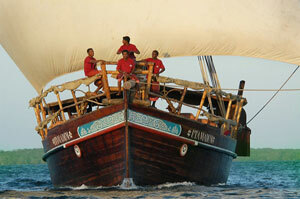 Leisure travelers with more time also have a selection of itineraries for long term stays of up to 10 days or more. With the various packages, you will have the opportunity to visit and stay in breath taking areas in Kenya ranging from the Western region – President Obama’s origins, to the Rift Valley area where our world renowned athletes are known to hail from to the Central Part of Kenya where the second highest mountain in Africa is – Mt. Kenya and where the first African woman received a Nobel Peace Prize (Prof. Wangari Mathai) is from. Not to be omitted is the unique Northern part of Kenya where man’s early days can be traced from the archaeological remains at Kobi Fora. Equally amazing is the Southern region where the 7th wonder of the world – “The Wildebeest Migration” is known to take place at the world renowned Maasai Mara Game Reserve. How can we forget the magical white beaches in the Coastal area and to top it all, the wonderful warmth of the Kenyan people. You are also at liberty to make up your own packages, just contact us with your requirements and we should be able to customize a package to your liking. We like to think that we can cater for your every need, no matter what it may be. 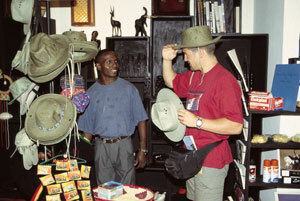 For the typical business traveler, there is just enough time to grab one or two souvenirs for your loved ones. If you have an eye for beauty, then we think you will appreciate the special selection of outlets we have put together for unique gifts/souvenirs. With the purchase of each item, you play your part in supporting the economic well being of individuals and especially women groups who are assisted economically through the sale of such items. We can organize to collect you from where you are staying in order to take you to the various outlets and thereafter drop you back to your hotel. Exclusive Eco Travels clients enjoy a discounted offer on all the items purchased from our partner outlets. Just another reason why to use our services! In our effort to offset carbon emissions linked with tourism activities such as air travel, Exclusive Eco Travels organizes carbon neutralizing activities such as tree planting by its clients. Where this is not possible for clients due to time constraints, a minimal fee can be contributed towards the purchase of a tree seedling.